Note that the following remains highly speculative. One of the challenges of this or any co-production situation is that we don’t know precisely how the economics are broken down—we know Gaumont cut their license fee from $750,000 to $185,000 between seasons one and three, but was the extra money made up through streaming deals and international sales, or did Gaumont choose to shoulder more of the financial burden in the interest of maintaining the NBC partnership? Are any of the international deals predicated on the show being a broadcast rather than streaming property in the United States? * Is there a specific license fee number that Gaumont needs from a U.S. distributor to move forward? All of this is unclear, but I want to break down a few options as best I can. * Bryan Fuller has confirmed this is likely the case in Variety. This reflects the order in which the series was sold: Gaumont secured a U.S. partner first, before then shopping international rights at MIPCOM (an international TV trade show), meaning that international stations/channels were buying a show they knew had the profile/reach/scale of a U.S. broadcast series. This does not mean that new international deals cannot be reached, but it means that existing deals may need to be restructured even if they find a new U.S. distributor. Specifically, I want to start by focusing on why the show’s value to Netflix is limited. Unlike some of the other streaming services, Netflix understands itself as an increasingly global brand, with its original series launching across its expanding number of countries supported by the platform. When House of Cards and Orange is the New Black first launched, they were in some cases sold into international markets by their respective producers (MRC, Lionsgate) and aired on local channels like any other imports. But as Netflix’s footprint grows, its original programming is now spread throughout its wider network, with internationally-aimed co-productions like Marco Polo and Sense8 explicitly designed to move across territories and build global value for the Netflix brand and build subscriber bases worldwide. But what this means is that it does not make broader financial sense for Netflix to invest in a show that they can only air in the United States. I know of at least one other international co-production that Netflix investigated picking up following the loss of a U.S. distributor, but the hangup in that case was that the show’s producer had just completed a deal for international rights that precluded Netflix having control of the show’s global distribution. And given that Sony is handling global distribution, and AXN’s significant stake in the series, it is unlikely that Netflix would be having conversations about anything more than the show airing in the United States. And that does not have the same value for a global company as it would for those with a stronger domestic focus. * Fuller has also confirmed this, telling The Hollywood Reporter “there’s certain avenues that I know we wouldn’t be able to do, for instance Netflix because our deal with Amazon precludes a Netflix component. So it’s not a good deal for them to make even though they’ve been so kind in terms of their enthusiasm for the show.” While Gaumont’s existing relationship with Netflix through both Hemlock Grove and Narcos likely has them interested, the Amazon streaming deal complicates this too much to make it a likely option. 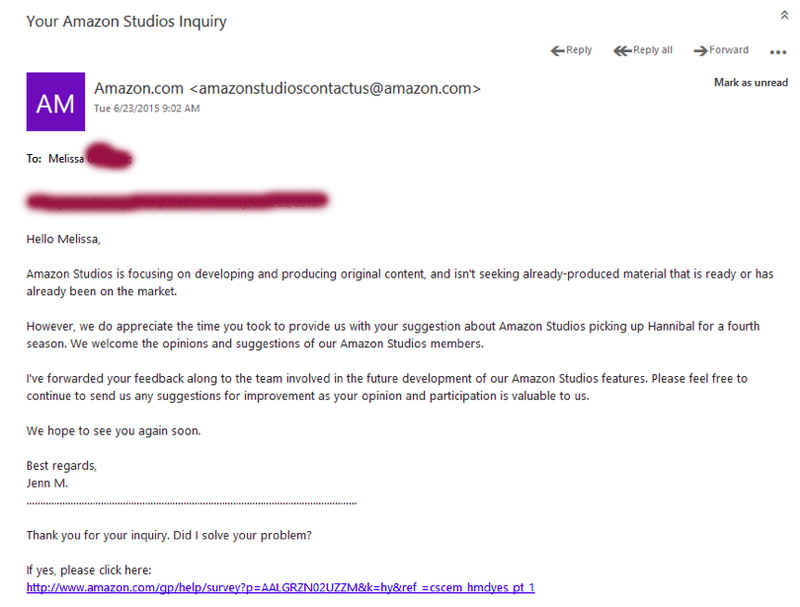 It appears that fans are getting a stock response that Amazon is focused on developing original productions as opposed to saving existing series when they are contacting customer service, and that has indeed been the company line—they’re apparently in talks to pick up busted CBS pilot Sneaky Pete (produced by Sony, coincidentally), but they are likely to put it through a version of their pilot process to reclaim its development as their own. But Amazon has also purchased U.S. rights to international series like Catastrophe and framed them as originals, and so the idea of entering into a co-production situation from a branding perspective is different from picking up a canceled U.S. show like Hulu did with The Mindy Project. The burden is much smaller, and if the brand value is still there, I don’t think Amazon’s stock customer service response will override broader value propositions. This is another obvious target, in part because they just picked up a canceled U.S. series in The Mindy Project, and also because Hannibal is available on the streaming service. But because NBC’s stake in the production is so limited, NBC’s co-ownership of Hulu doesn’t actually make it as attractive an option as Mindy—produced by NBC Universal, despite airing on Fox—from a production perspective. At the same time, though, they are a U.S.-only distributor, with no international component, meaning they function more like a domestic cable channel than some of the other streaming services. And so they have done licensing deals as part of their “Hulu Exclusives” branding with a number of series from the U.K. and Canada at various points in its life, meaning there is some precedent for them serving as a U.S. distributor in the way Hannibal requires. But it’s weird that Sony’s own Crackle service seems to be so absent from these discussions, which says a lot about why Sony might be interested in having something to work with. The service is launching its first original drama, The Art of More, along with the high-profile—if not high-culture—swing of the Joe Dirt sequel. They are also a purely domestic distributor, meaning that they could work as a logical U.S. partner in conjunction with Sony’s international distribution of the series. It’s a logical fit, but it’s unclear just where Crackle fits into the broader synergy at Sony. Just look at Community, which as a Sony-produced show was expected to land at Crackle over another streaming provider, but it was Yahoo! who ended up making that deal. Corporate synergy would suggest Crackle as an obvious home, but if the arms of the company aren’t in coordination, it’s tougher to know how that synergy is understood by those involved, and where a show like Hannibal would fit within it. Although the list of potential U.S. distributors for Hannibal is not infinite, it is also extensive. At the license fee reported, a large number of smaller cable channels (Sundance, Pivot) or streaming services (Yahoo!, AMC’s beta testing Shudder horror network) might be willing to make the financial commitment to make a big splash in original programming with a show like Hannibal. The series’ economics have always made the inevitable conclusion of its run on NBC—I honestly thought this would happen last year—a more open-ended proposition, especially when the show is an independent production. While I think the niche audience the show developed makes a streaming service more likely, the door is more open in this case than it would be a traditionally canceled series. But it is not wide open, and each of the outlets above have reasons why they might not be willing to take on the license agreement that Gaumont is offering. It’s also unclear what kind of deal Gaumont wants. The early cancellation—given that NBC intends to air all 13 episodes of the third season—gives them plenty of time to work out a deal before the season ends, but what’s unclear is what exactly they’re looking for. While Fuller is on the record as wanting to continue, and giving the show a 50/50 chance in a more recent interview, what is Gaumont’s bottom line? Those are the types of financial details that will remain opaque, and place Hannibal’s fate at the mercy of an uncertain design. So since writing this, fans have started posting screenshots of their interactions with customer service representatives from Netflix and Amazon, using them to make two points that contradict the above handicapping. The first is that Netflix seems highly enthusiastic, and the second is that Amazon has a company stance against decisions like this one. There is legitimately nothing that can be read into this. Customer service representatives are there to do a specific job: to make the customer feel they are being heard. In Netflix’s case, as demonstrated on the left, they have clearly taken on a strong policy of engaging with the user on their own preferences. They want to paint a picture of Netflix as a site for media lovers staffed by media lovers, and engage accordingly. The fact they’re receiving a lot of notes about a series means nothing if the economics of the deal don’t work, but the people fielding these chats have no idea how this works. They know they’re supposed to make the customer feel heard. 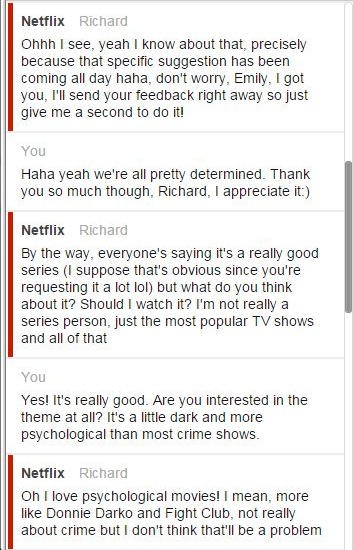 While putting in a request with Netflix is not without value, you cannot read into their response on any level. It is meaningless. Amazon is more complicated, but it’s clear they don’t have the same policy. They have a clear party line that their customer service representatives—likely working out of call centers outside of the United States—have been asked to deliver when people ask them to pick up existing series. The fact is that Jenn M. knows nothing about the specifics of Hannibal’s case as an international co-production with an existing streaming deal with Amazon. Jenn M. has no reason to know this. It is not part of her job description. Her job description is to send you the same email they’d send someone who is asking Amazon to resurrect CBS’ short-lived 2008 sitcom Worst Week starring Kyle Bornheimer. There has always been a range of tweets and Tumblr posts from people who are in territories other than the United States who are posting or asking questions about Hannibal in their own countries. If the show continues for a fourth season, it is possible that nothing might change—if you are in the U.K., the show’s rights could potentially just remain with Sky, meaning there would be no change in how you access the show. It’s one of the challenges of this deal, as it’s not like Hannibal is losing its international distribution—that’s the only thing that’s theoretically stable, provided Gaumont is able to renew those deals while also finding an American partner. As noted in the above additions, that may not be the case in all instances, but the presence of those international deals (and the possibility of continuing or at least replacing them) changes the metrics in this case. Accordingly, if fans wanted to also talk to their local broadcasters about their continued support of the show, that would seem a more direct strategy than talking to local arms of streaming sites or focusing your attention on U.S. sources that—depending on your location—will never see any of your business. I almost don’t even want to address this given that it gives them more promotion, but a nascent TV Everywhere channel building a streaming platform took to Twitter to tell fans they were trying to save Hannibal shortly after its cancellation, creating a legitimately decent amount of people tweeting and retweeting about the site’s efforts. Beyond the fact that this is a nascent platform peddling mainly in obscure web series and with no legitimate place within U.S. distribution systems, the fact they claimed to have contacted NBC—who no longer has any role in the show—can be read as a clear sign they’re using this as a way to build profile and gain subscribers and have fundamentally zero chance of playing any role in this decision. Props to their social media intern for managing to get a few fans to subscribe to their service with some hashtag spamming, but the jig is up. 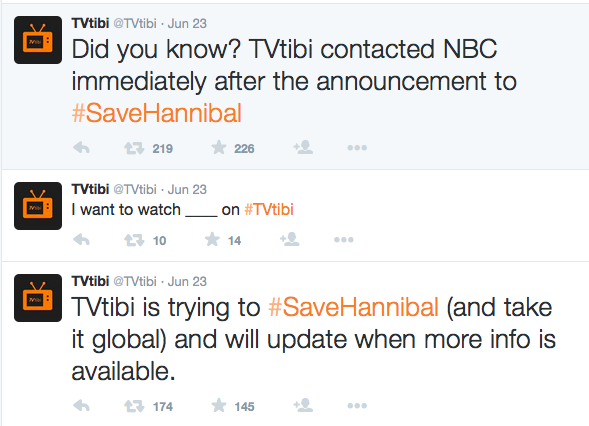 Edit: Since I wrote this, TVTibi has legitimately shocked me by refusing to go away. They have even taken to Reddit dismissing my initial evaluation of their capacity to help the show, pushing back against the people who posted it by joking, “If it’s on the Internet, it must be true, right?” They also did a lengthy Q&A with the Geekiary where they continue to claim that they are in the midst of serious negotiations, writing as though them having access to the show is an eventuality, and speaking with certainty about negotiations that would be uncertain even if they were a viable production partner. Let me be absolutely unequivocal: TVTibi is in over their heads, and has no understanding of the situation they are in. They are a TV Everywhere service that operates on a global scale (so: basically YouTube you pay for), and use this as part of their value to Hannibal as though the series isn’t already sold in global markets, which would preclude anyone from selling Global rights to them. They don’t have a clear grasp of this situation, and to present themselves as absolutely or even theoretically having access to Hannibal in the future is purely a strategy to draw subscribers, which helps show growth, which helps them draw investors. I don’t know that I would go so far as to say they are scamming Hannibal fans (which was a problem during the efforts to save Community), but let me be completely clear: they are not a viable home for Hannibal, will never be a viable home, and the idea that they’re presenting themselves as such is fundamentally and completely disingenuous. Amazon Prime have picked up a cancelled series in the past, but their distribution was limited to the UK: Ripper Street, which they’ve ordered three seasons of. They showed the third season in the UK, but the rights stuck with BBC America in the US. Yeah, I excluded that if only because it felt very much of the moment of Amazon’s nascency in the UK market and the effort to push the rebranding from LoveFilm toward Prime and exclusive TV offerings. I don’t know if, given the maturing of their original content in the U.S. through multiple pilot seasons, the same logic still applies. But thanks for adding it. Yep—streaming rights for Canada are separate in this case because the rights went to Amazon in the U.S. This is the case with a lot of shows that made U.S. streaming deals with other sites (like Community with Hulu, for example). Canadian Netflix is therefore not always a great indicator. So do you think that means that in Canada we will continue to get new seasons of Hannibal on Netflix? Honestly, this whole thing is so confusing–what I’m understanding is that the show is still going to be made beyond the 3rd season, correct? Like Gaumont has already agreed to make a 4th at the very least? And it will be distributed internationally by Sony, AXN, etc? And if I’m right about all that, will Netflix Canada air the 4th and whatever future seasons? Gaumont has not said they will definitely produce a fourth season, but the license fee is low enough that it’s highly feasible provided they find a new US distributor, and maybe feasible without one. The Netflix deal in Canada is one of the ways they make back their investment in the show, so if the series were to continue, it would still be available there provided the current license deal remains in place. THANK YOU. I have been looking for answers to these questions and found nothing clear! Do you know anything about http://www.tvtibi.com? They have been commenting on twitter that they have approached the producers re saving Hannibal. I’ve seen a few tweets about this, and I’ll put this as simply as I can: They are an opportunistic startup that is taking advantage of intense fan support to raise their profile. They are not a U.S. distributor, and in no way can impact Hannibal’s fate. They can approach all they want: they are not a factor here, and suggesting they are is disingenuous. Hey, thanks for putting together such a great, in-depth article! Learned a lot. As it turns out, “keeping the show going” is more complicated because of what Gaumont needs from potential partners i.e. an apparatus for distribution within the U.S. Here’s where I’m uneasy. It looks like TVtibi didn’t have all the information they needed to understand how the game is played, or one would think they’d have stayed out of it. This makes them naive, amateurish, but not malicious. It just seems a little heavy-handed to vilify a person or company for what might have been a completely harmless, well-intentioned gesture, if your position was based solely on the fact that they made a play for Hannibal (and advertised doing so to fans) without being the right fit for a partnership with Gaumont. Maybe it’s as simple as they didn’t know that they weren’t the right fit because they didn’t understand what Gaumont needed. Kudos to them for trying to help, even if they now look silly for announcing their move when they shouldn’t have been playing in the first place. If they knew that they didn’t have what Hannibal needed and made a play anyway, well, kudos to you for calling them out on it. It just seems fairer to give them the benefit of the doubt until we have more information. Thanks for your comment, Isabelle. At the end of the day, I’d be more charitable with TVTibi if they weren’t being so insistent that there are real negotiations when there is no universe where a startup TV everywhere site with almost no existing content deals beyond minor web series has any opportunity to draw rights to a high-profile television series. It’s just not a platform where that is even remotely feasible—this is a real television show, with territorial rights that would be entirely contradicted by a global TV Everywhere service that operates independent of (and potentially in direct opposition to) traditional distribution patterns. And I would feel worse about being cynical if not for the fact they are continuing to insist to fans that they are in negotiations, and the certainty with which they speak of these efforts in the Geekiary piece. That is completely misleading, and the fact they would ever speak in certainty regarding the future of incredibly complex negotiations (even if they WERE a real option) says a lot about their goals here. They want people to subscribe to their service, with the hopes they will done day achieve something they are not going to acheive. Subscribers = money, but also the ability to show subscriber growth to potential investors. Their initial claim was, perhaps, purely optimism mixed with ignorance regarding the situation—which, in the case of saying they had been in touch with “NBC,” they have since tried to claim as not being able to fit all the production partners into their tweet, which I don’t buy for a second—but their continued engagement with fans has shown them to be completely unwilling to acknowledge that are not a viable distributor for this television program, and to act in this way is fundamentally disingenuous. Chiller TV, or even Syfy? Or did NBC Uni take all of their networks off the board for consideration at the same time? What about A & E as a companion for Damien? I would guess they would have worked out a cable deal in family if they could have done so before announcing a cancellation. And it’s less clear where a cable channel would stand ratings wise to make an investment worthwhile – streaming services don’t report ratings, so there are other value metrics that we can’t access that could make the show viable. Quick correction: the UK rights are with Sky Living, not Sky Atlantic, despite it being much more suited to the latter. I think it’s a pride thing; the only US network show Atlantic have is Blue Bloods, which is much more suited to Living, which shows Grey’s, Elementary, Bones, etc. Thanks, I’m not up on my web of Sky-branded cable channels, clearly. Can I just say that I am grateful it’s on Sky Living & not Sky Atlantic. Sky Atlantic is for Sky Satellite subscribers only. I live in an apartment in Ireland where satellite dishes are not allowed (common in many if not most apartment blocks). Sky Living and some other Sky channels come with my cable package but not Sky Atlantic which is exclusively for satellite subscribers. If you think financing TV is complicated, try watching TV! So to put it plainly, there is no hope. in Taiwan, we watch Hannibal under AXN channels. The countries in Asia that have AXN channels are able to watch that program too. We cannot watch any program through Netflick or Amazon so if season 4 happens, we still watch Hannibal through AXN channels. I’ll be happy if it is saved anywhere, but with Amazon already having the streaming rights, it is already available in that venue. Not that Hannibal has even been nominated, but it still seems at this moment in time shows on Network, Cable, Premium channels still get a little more recognition and respect. I studied TV in grad school over ten years ago and it is thoroughly amazing how much streaming/online has changed the business. Thanks for this thorough article. I’m hoping for the best but preparing for the worst. Thanks for the article! For those who live outside USA and want to access Netflix, you can use UnoTelly. It changes your IP address so you can get US Netflix. Pingback: Are International Co-Productions The Future of TV Drama? – Den of Geek! Disingenuous is too kind for TVtibi. I worked for the company until they stopped paying me. For over a year the COO, Marlon Gillett has mislead me regaeding payment dates. The text and email archive I have with this man is embarrassing to say the very least. After some research I discovered the CEO’s personal Twitter account. It paints a picture of an inolerant, homophobic individual who has no place in business of any kind. If I knew what type of person he was I would never have worked with the company. At this point I just want their balance paid so I can move on and put this disaster behind me. Do yourself a favor… Do not work with this company or provide content to the platform. You will reach more viewers with youtube and feel much better about yourself.